Nagler (19.08.05) - TAIPEI 2005 - 18th Asian International Stamp Exhibition. 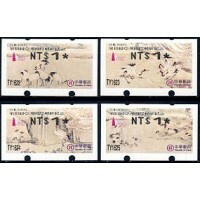 Mint set 4 designs (4 x NT$ 1). Nagler (19.08.05) - TAIPEI 2005 - 18th Asian International Stamp Exhibition. First Day Cover with the 4 ATMs (4 x NT$ 5). Nagler (19.08.05) - TAIPEI 2005 - 18th Asian International Stamp Exhibition. 4 First Day Covers posted to Spain (4 x NT$17). Nagler (19.08.05) - TAIPEI 2005 - 18th Asian International Stamp Exhibition. Commemorative folder with 4 sets (1 per design), with the 4 values for inland postage (4 sets x NT$ 5-12-25-32). Nagler (19.08.05) - TAIPEI 2005 - 18th Asian International Stamp Exhibition. 4 sets (1 per design) with the 4 values for international postage (4 sets x NT$ 9-13-15-17).